New York Independent System Operator, Inc.
St. Lawrence Gas Company, Inc.
We hope you find these pages informative. Feel free to offer suggestions on how to improve these pages. Organize electrical workers to promote reasonable methods of work, secure employment, reduce hours of daily labor, secure adequate pay for work, and to seek a higher standard of living and security for members. To cultivate feelings of friendship among those of our industry. To assist each other in sickness and distress, and by legal and proper means, to elevate the moral, intellectual, and social conditions of our members, their families, and dependents in the interest of a higher standard of citizenship. 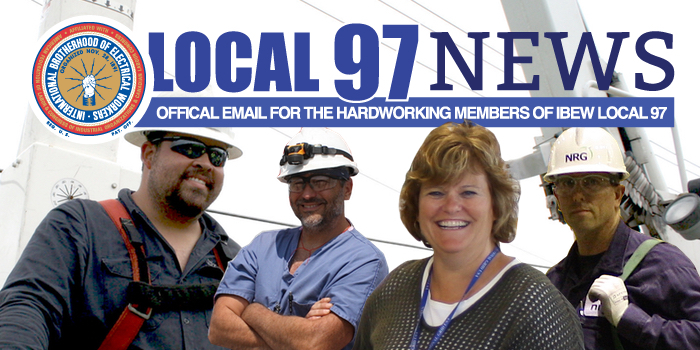 Local 97 relies on the help of our elected representatives in state and local government to assist us in our efforts to protect our jobs and provide a quality work environment its members. This page will provide you with the latest developments on the political front. Please contact us with questions or suggestions. The Comittee On Political Education of the IBEW is a group of members who keep other members informed on legislative issues related to the workplace. These include labor, worker safety, workers compensation, licensing, unemployment insurance and many other issues. COPE members get involved in local, State and National elections. They lobby for legislation that affects workers at the General Assembly. You don’t have to be on the committee to participate in COPE. You can voluntarily contribute to COPE through payroll deduction. By signing a COPE “check-off” card, $0.03 per hour of your wages goes to help fund the activities mentioned above. You will be supporting candidates, regardless of party affiliation, who have a proven record of supporting the working families of New York. If you don’t currently participate, please consider helping your brothers who work very hard to make sure that workers in New York have a voice in political matters. We encourage all members to get involved in politics at any level but especially at the locality inwhich you live. Educate yourself on the issues and make an informed decision when you vote. Participate in “grass roots” campaigns on issues that you are interested in. Together, we can make the IBEW a political power. To donate to COPE please contact the union office via email or call us at 315.476.9797 and a payroll deduction card will be sent to you.